The decision of the “Schilling Act" on 20th December 1924 the Schilling was introduced in Austria on 1st March 1925. 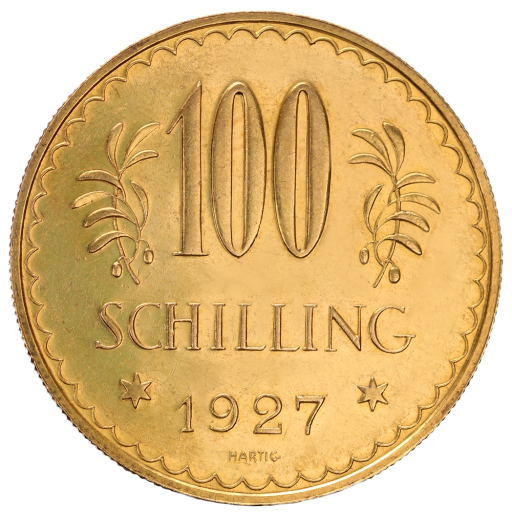 The 100 Schilling gold coin was already issued the following year, in addition to the 25 Schilling gold coin, as the first gold coin of the new Schilling currency. From 1926 to 1934 in the first Republic they were minted with the appropriate emblem on the front, the issues from 1935 to 1938 bear the emblem of the corporate state. The coin has a purity of 900/1000 and a fineness of 21.17g, with a total weight of 23.523g. Its diameter is 33.0mm. At the center of the gold coin is the federal eagle of the first Republic, surrounded by a circle with dots. On the right it carried a sickle blade turned inwards and on the left a hammer. His chest is decorated with a red coat of arms with criss-crossed silver crossbar. Above the eagle in a semicircle from left to right, the words "REPUBLIC" and below, again from left to right in a half circle, "AUSTRIA" are inscribed. Around the writing almost at the edge of the coin is another dotted circle. On the back of the Austrian gold coin are three lines with the font becoming ever smaller, the first line says "100", the second "Schilling" and the third the year, for example "1929". Also inscribed in very small writing is the name of the designer of these coins - "HARTIG" (Arnold Hartig). To the left and right over the year is one star each. To the left and right of the "100" is an ear branch each. The edge of the coin is surrounded by a wavy circle.